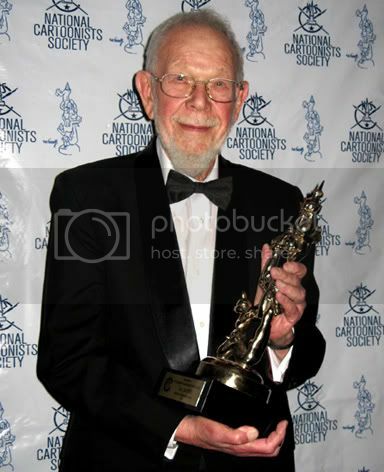 Al Jaffee Wins the Reuben Award! Mad Magazine Veteran Al Jaffee has won the Reuben Award for Outstanding Cartoonist of the Year. He received the coveted trophy at the traditional black tie gala during the 62nd Reuben Awards Ceremony, which was held at the Ritz-Carlton, New Orleans on May 25. It was the veteran’s first Reuben Award nomination, having previously won three NCS Division awards during the 1970s. Jaffee beat out fellow nominees “Speed Bump” creator Dave Coverly and Dan Piraro of “Bizarro” fame.